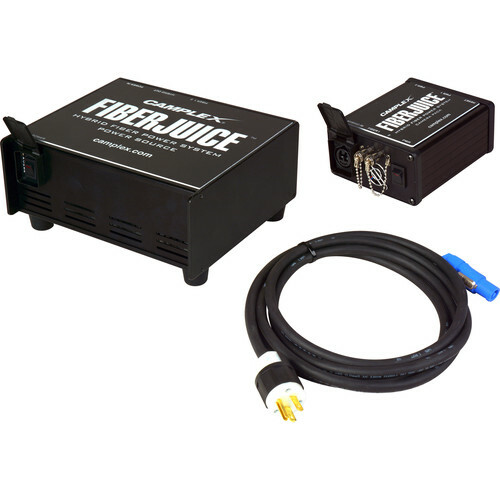 Deliver safe, low voltage camera power up to 328 feet over opticalCON SMPTE standard fiber optic cables with this Camplex FIBERJUICE power supply system. The Camplex FIBERJUICE system injects power over Neutrik opticalCON SMPTE DUO cables for powering outside broadcast & field production cameras to eliminate the need for local power & batteries at the camera end. Delivers enough juice to power cameras, lights, lens control units and more! The FIBERJUICE system is comprised of two modules. The power injection base station [Base-Unit] and a smaller lightweight opticalCON camera output box [Camera-Pack]. The Base-Unit at the front end combines 2-channel fiber from your fiber converter AND power (from AC source) on a single opticalCON cable. The Camera-Pack breakout box delivers safe, regulated 12-Volt DC with up to 8-Amps max power to the camera & its accessories as well as 2 channels of fiber I/O.